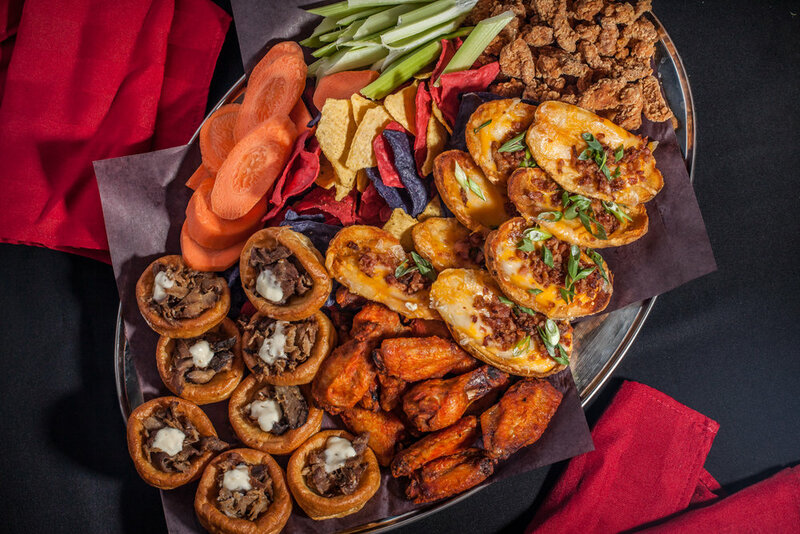 Mini Yorkshire Puddings, Potato Skins with bacon bits, Boneless pork dry ribs and Frank's Red Hot chicken wings accompanies by fresh carrots and celery sticks along with tortilla chips and sauces for dipping, including sour cream, salsa and ranch. Pork dumplings, Korean beef steak, Chicken wonton twists, and Fried rice patties, accompanied by fresh red pepper and cucumber slices. Served with crisp wontons and sauces for dipping, including almond satay, sweet & sour, and soy sauce. Pizza rolls, Spring rolls, Veggie samosas, Jalapeno cheddar poppers, and Onion rings accompanied by fresh broccoli and carrot sticks, Served with crisp potato chips and sauces for dipping, including pizza sauce, plum sauce and ranch. 10 white buns & 10 whole grain buns of BBQ beef sliders served with horseradish mayo and garnished with garlic dill pickles on the side. BBQ pork back ribs, Orange Glazed Duck Wings, Italian Roasted meatballs, Grilled Spolumbo’s Sausage served with Marinara Sauce & BBQ Sauce for dipping. A mouth-watering assortment of dessert squares. Southern Fried Popcorn Shrimp, Calamari with Tzatziki, Sriracha Cod Bites, Crab and artichoke dip, Bacon Wrapped Scallops served with Fresh Pasta chips. Queso Cheese dip, Nacho chips, Broccoli cheese balls, Mac and cheese bites, Pizza Spring Rolls & Double sided Grilled Cheese. A variety of fresh, seasonal vegetables. Tzatziki, Hummus, and Garden vegetable cream cheese served with an assortment of chips, bread, and crackers. A variety of fresh, seasonal fruit.